First, toast your pumpkin seeds (if you choose to do that): Preheat oven to 350 F and toast pumpkin seeds for 10 minutes. Remove mixture from food processor and press into the bottom of a medium-sized (mine was about 5” x 5”) Tupperware container. Place in the fridge, and let set for about 2-4 hours. 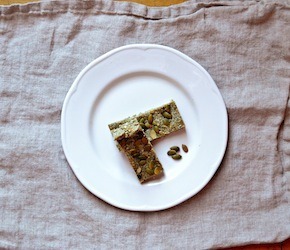 When time has elapsed, remove from fridge and cut hardened mixture into bars or squares. Store in fridge or freezer…they will melt at room temperature!